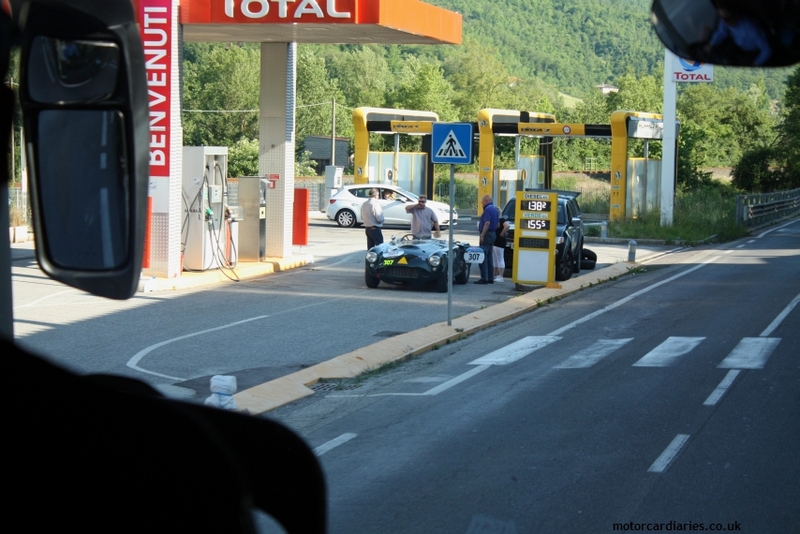 Saturday involves a typically antisocial race meeting start but a coach transfer to Mugello is welcome and we arrive with the dew still on the ground and the residents slowly awakening from the previous day’s indulgences. 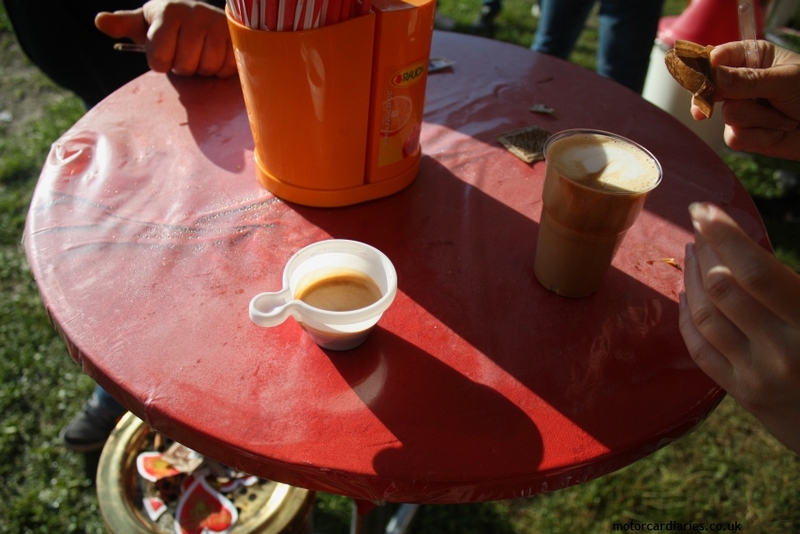 This being Italy, we have barely stepped over the threshold before we are able to purchase a top-notch espresso to reanimate dulled synapses. This place has an atmosphere all of its own. 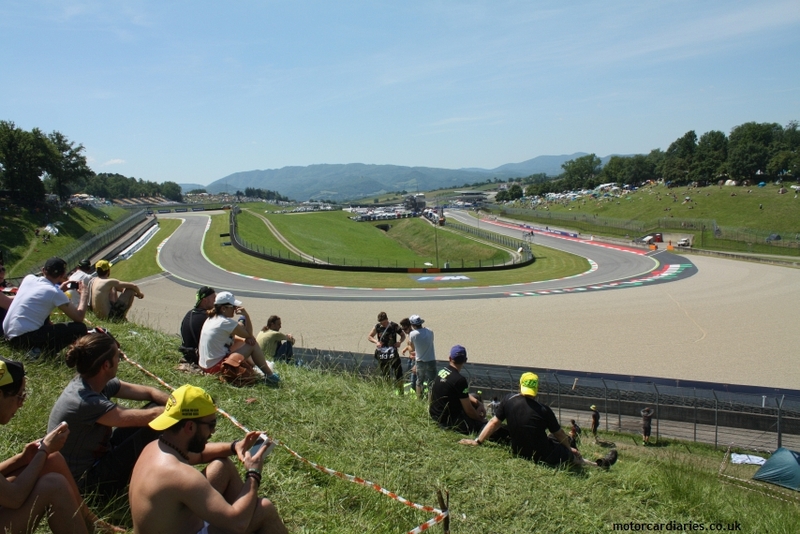 The old sprawling road course has long since given way to a purpose-built circuit but it floats unobtrusively through a beautiful valley, seeming only to change direction at the behest of the terrain. While it may look ridden by chicanes on plan, each of these flik-flaks is in fact a seriously quick sequence, creating a wonderful flow over the full lap. 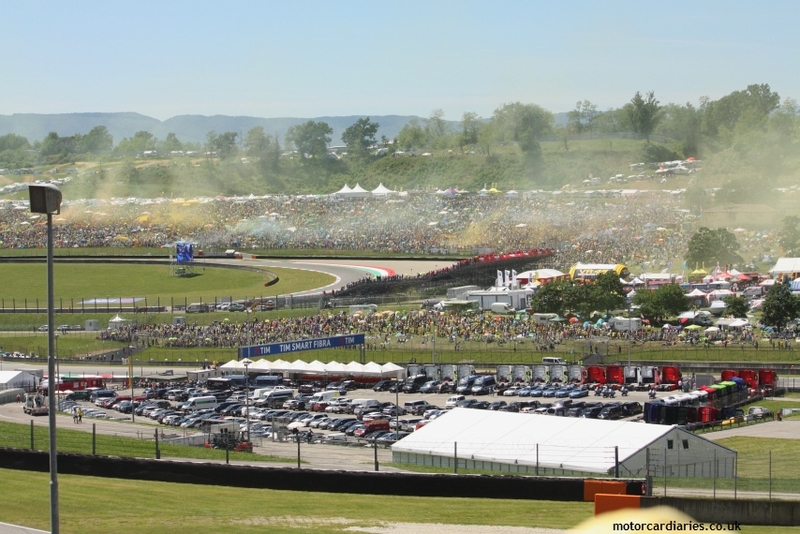 The grace of the circuit, and its location, juxtaposes spectacularly with a crowd which must rank as the most riotous anywhere in the world. Perhaps the Talladega infield during the 1970s was more hedonistic – and certainly Bathurst in the 80s more menacing – but the sheer lunacy of the spectators is unlike anything I’ve ever witnessed before. It starts with the accommodation. 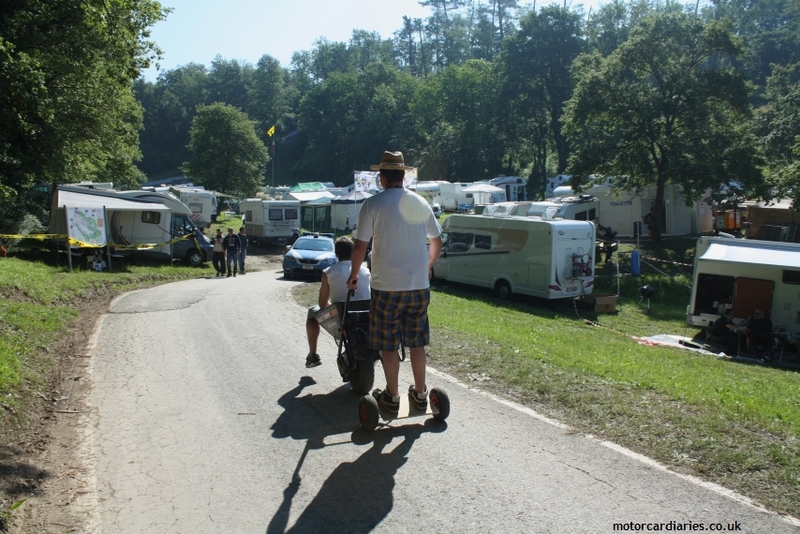 Forget the carefully organised campsites you might find at so many circuits; instead you simply deposit your tent / camper van / car / whatever on whichever piece of grass is available. 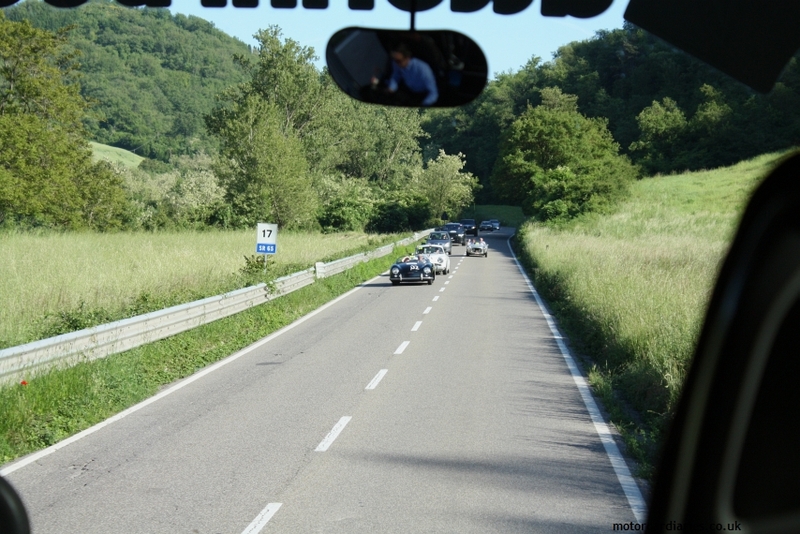 Don’t worry if it’s a steep bank – you’ll be so smashed by the time you get to bed that it won’t matter. 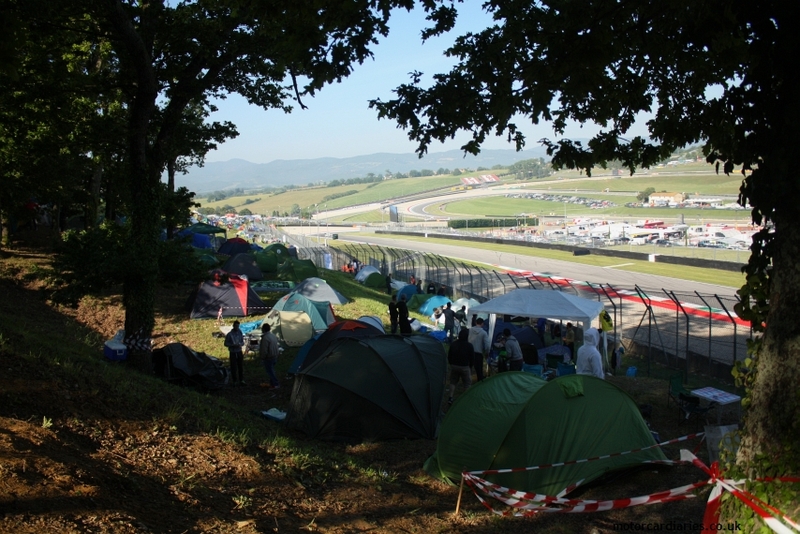 The entire site is littered with makeshift beds, many with commanding views of the track itself. It’s certainly democratic if nothing else. As the sun bakes off the morning dew and the gentle mists clear, the crowd awakens and the madness begins. 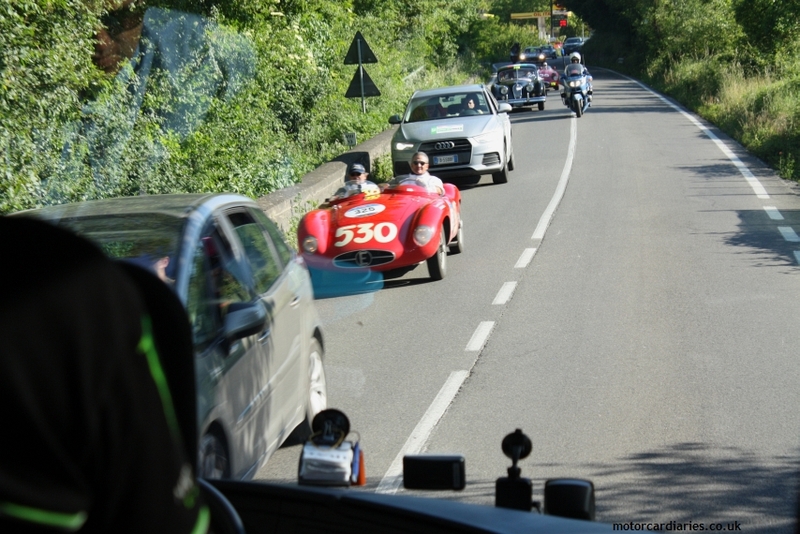 Motorcycles and ridiculous vehicles bomb around the site access roads at speeds befitting the competitors in the motorcycle grand prix themselves. Often there are many folk to a single contraption – my personal favourite being the two maniacs piloting a motorised wheelbarrow. 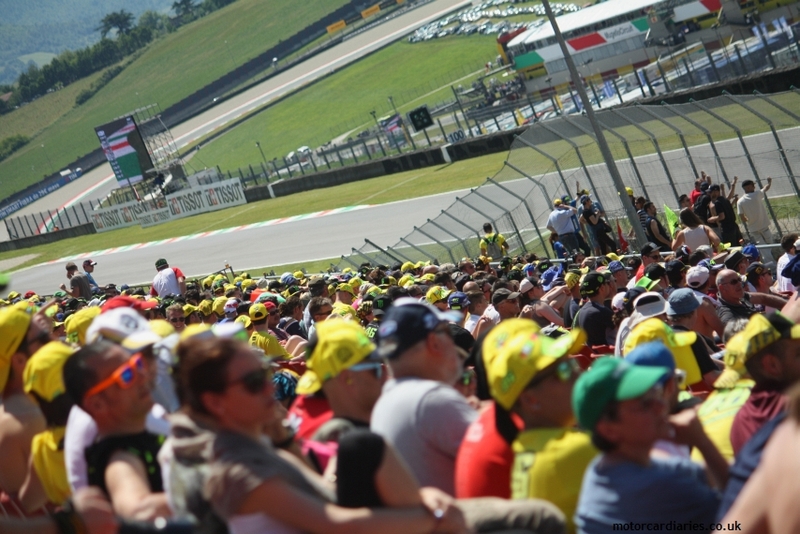 As if this frenetic activity isn’t enough to keep you on your toes, then there’s the noise…the aural backdrop to Mugello is the chainsaw. 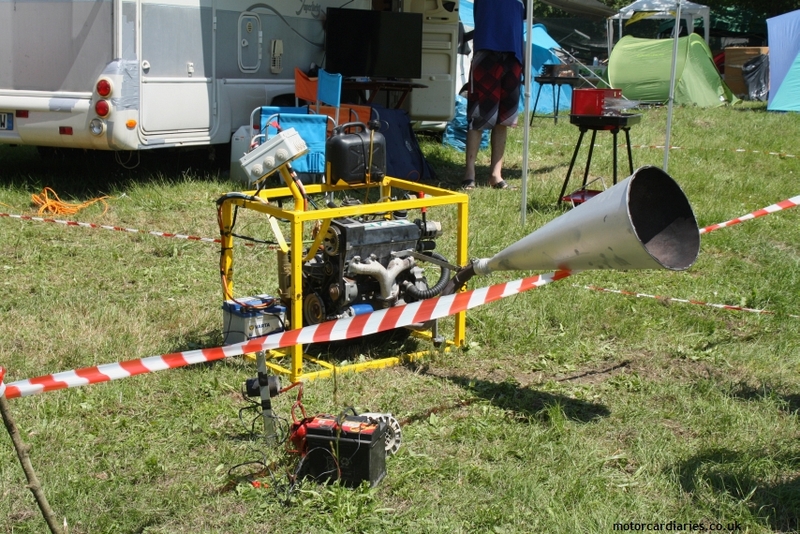 Committed enthusiasts remove the blades then add megaphone exhausts to create highly obnoxious, but ultimately harmless, buzz boxes. Some creative souls have also strapped engines to frames which they periodically start up and rev to oblivion. Set to full rich, these Mad Max motors belch vast tracts of flame, set to a suitably apocalyptic soundtrack. We follow the course anti-clockwise from the main entrance, at the site’s highest point – reached through its famous archway. 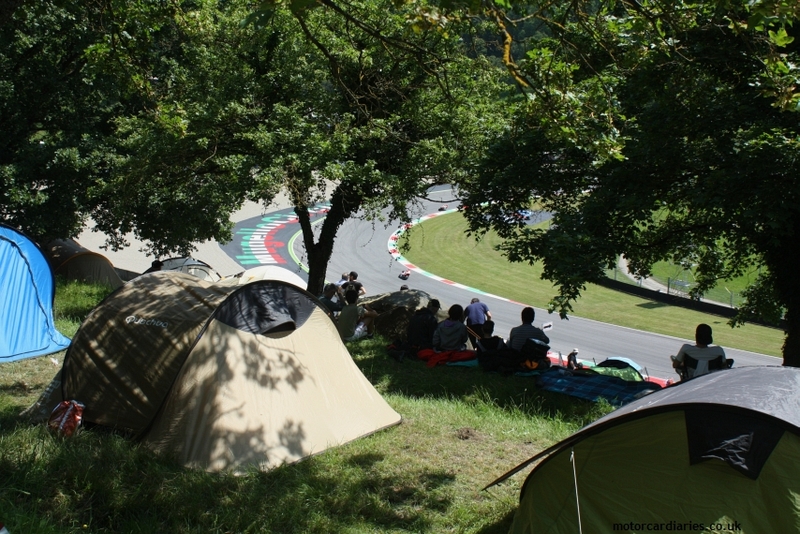 It is a magnificent place, with varied and spectacular views from atop steep banks. In among all the mania, it’s comforting to find a food vendor carefully slicing microscopic slivers of the finest prosciutto. Just like the old boys I once saw enjoying a sit-down dinner at the trackside at Monza (replete with tablecloth and bottle of red served in goblets); the Italians can’t help taking their comestibles extremely seriously. 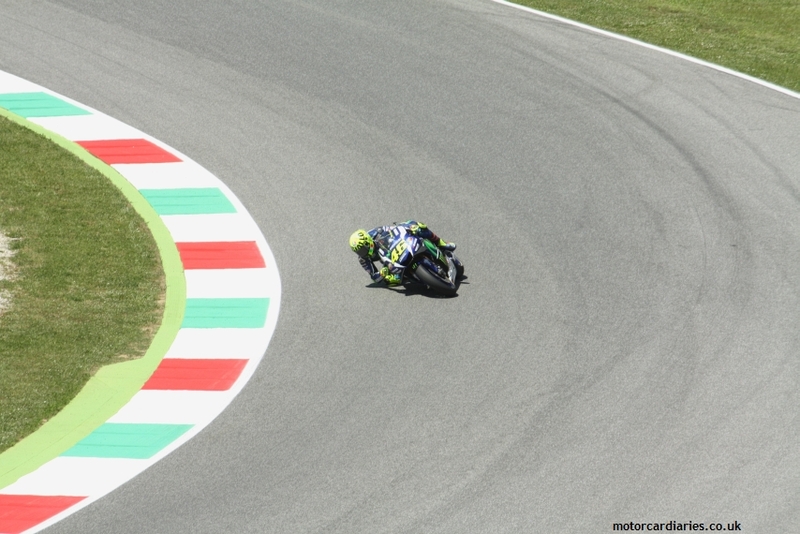 Of course, Mugello is Valentino Rossi’s land. The home fans are devoted to one man, and one man only. His signature yellow merchandise is everywhere. It’s impossible not to get swept up in the spirit of things so naturally I purchase a peerlessly gaudy cap to ingratiate myself with the partisan crowd. 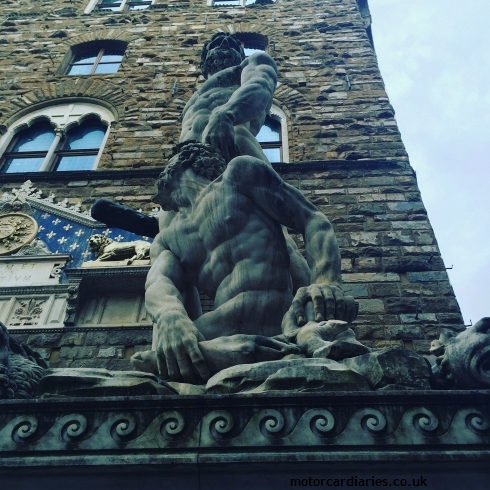 Looking like a bona fide Rossi fan, we stroll among the crowds almost incognito – only our pasty skin and lack of chainsaw betraying our Yorkshire roots. Practice has been running throughout the morning and the circuit offers great spectating, if not great photographic opportunities. 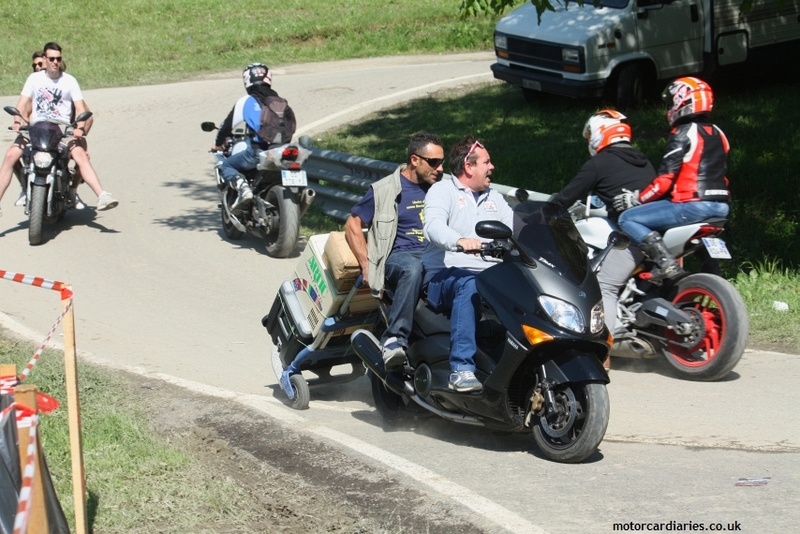 The long, flowing corners allow the riders to really express themselves. 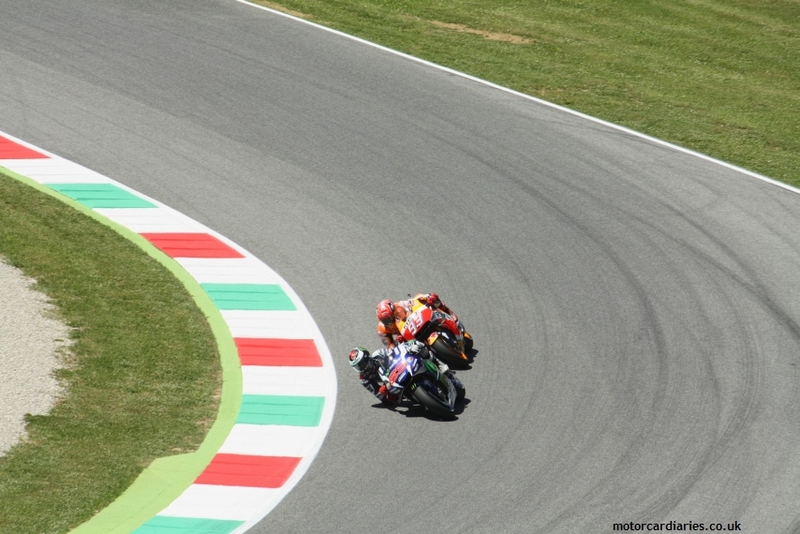 Turn one is a great spot as the motorcycles are forced to shed over 100mph in the braking zone. 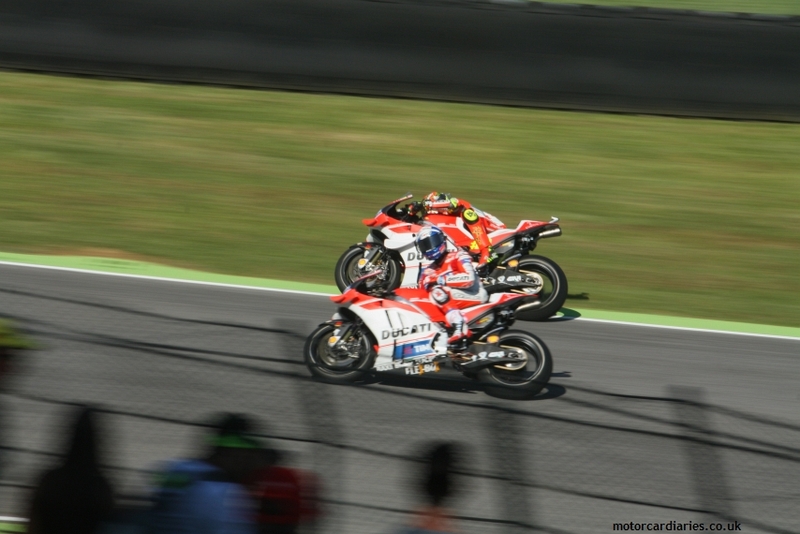 The riders in the top class are knocking on the door of 220mph with a tow – absolutely bewildering to behold at close quarters. 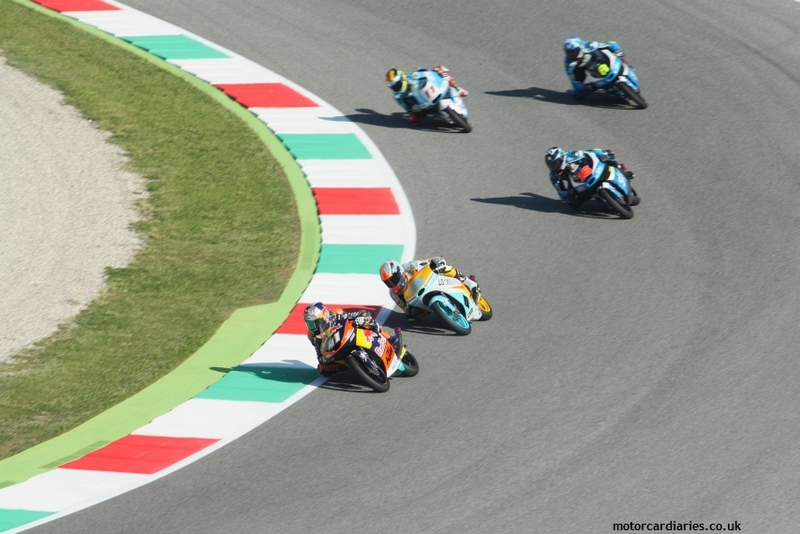 Even the second tier Moto2 ‘bikes are hitting well over 180mph. The big stop into turn one naturally catches out many of the riders but there’s plenty of Tarmac run-off to catch most mistakes. We hit our grandstand for qualifying and get the full atmosphere for the build-up to Saturday’s main event. 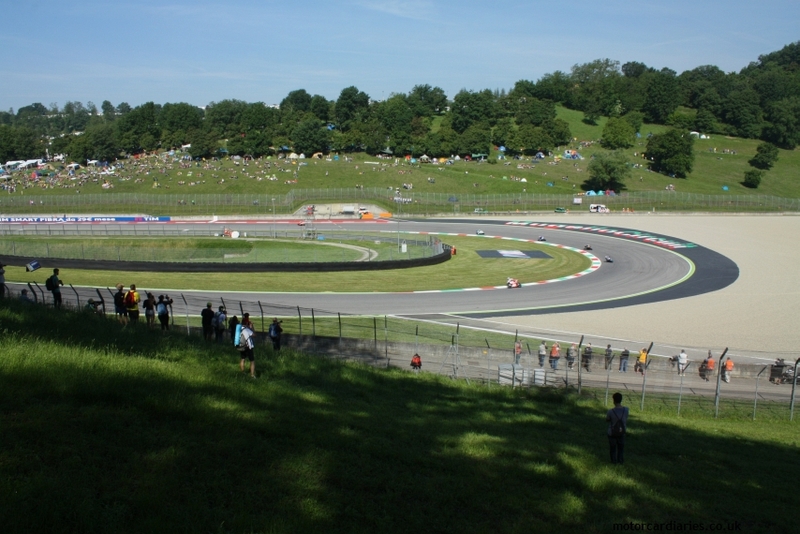 We are on the outfield, above the left-right of Borgo San Lorenzo, with a great view of both track and big screen. 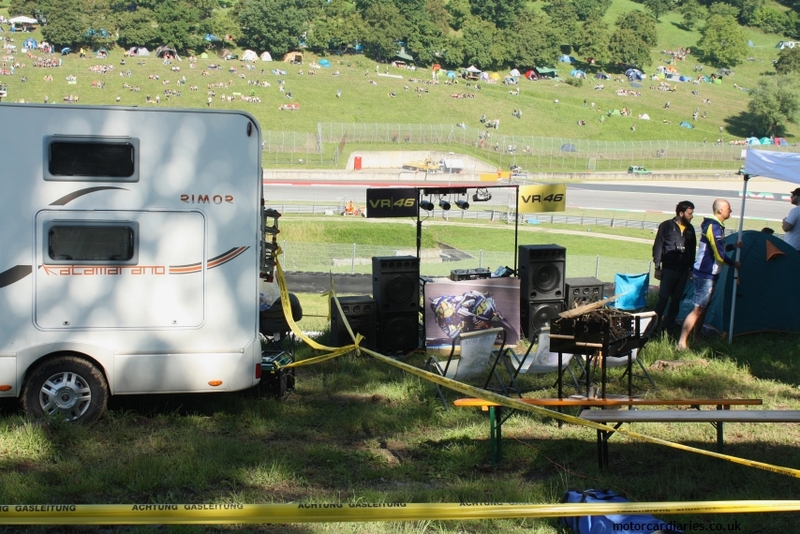 Just to our right is the so-called Rossi Hill, where the great Italian’s fan club occupies a couple of acres of prime real estate. Woe betide anyone striding in there without the requisite yellow merch. 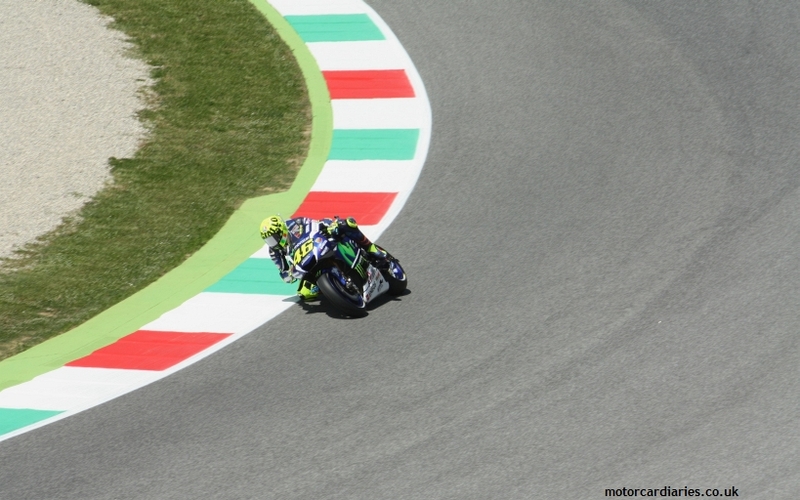 The big news emerging from the session is that the local hero has done it – Rossi has stolen pole! 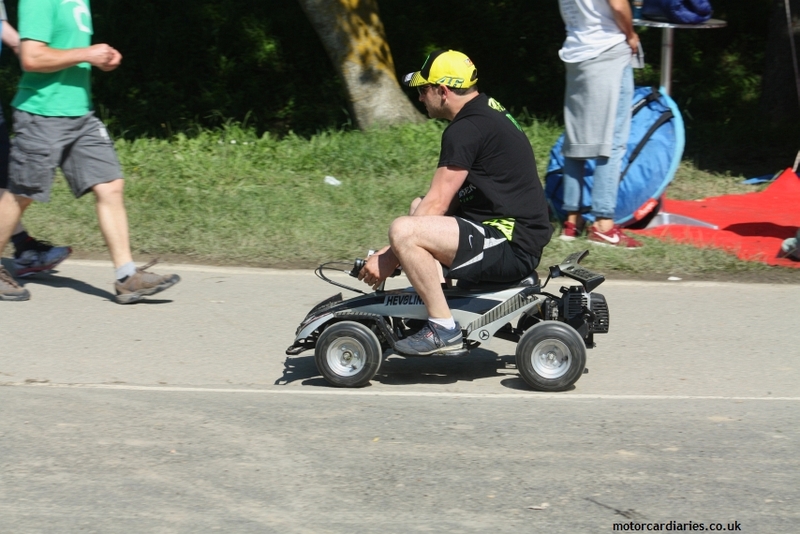 Twenty years into his grand prix career and once more he proves himself the fastest man in the world. 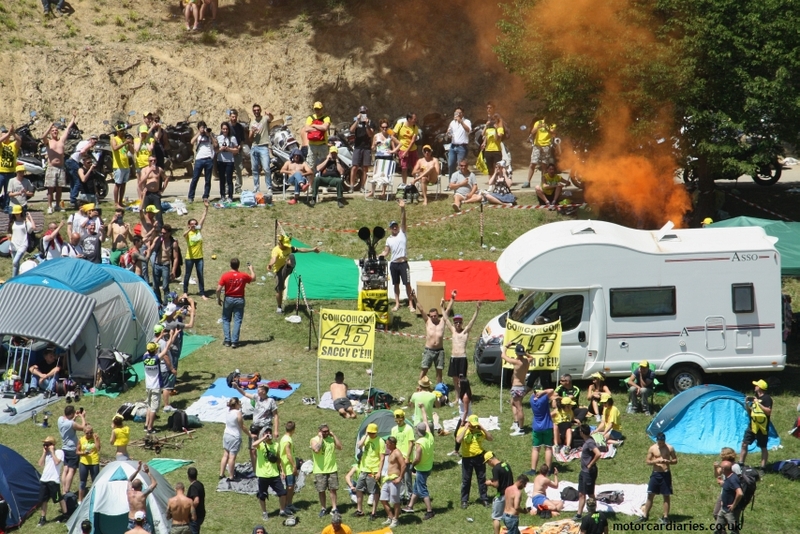 The place erupts: claxons sound, yellow smoke fills the air and the crowds (vocally) salute their hero. We barely note the rest of the order; such is the furore surrounding the pole sitter. This is an extremely special moment – and I’d defy any motorsport lover not to get goosebumps at the emotion on display. 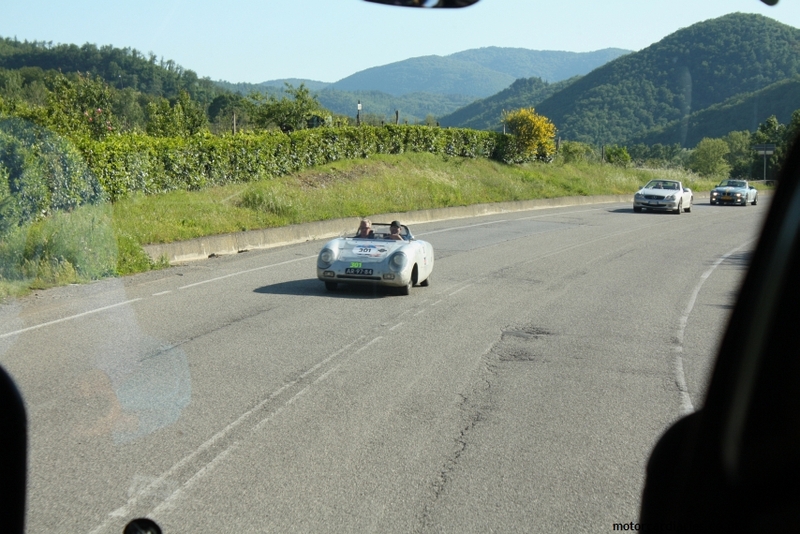 The coach ride back to Florence takes us along some fabulous, winding roads and for twenty glorious minutes, we find ourselves with the entire Mille Miglia field running towards us on the opposite side of the road. 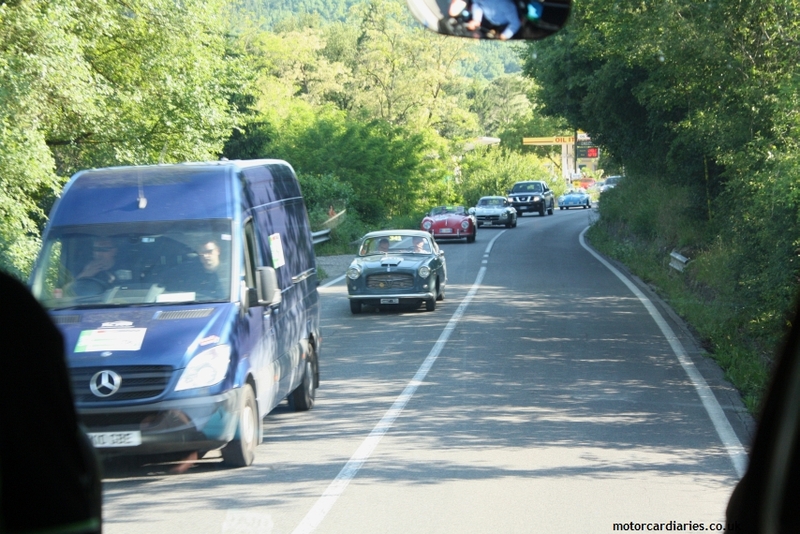 In fact, at times it’s running towards us on the same side of the road but gung ho overtaking is what this country is all about. 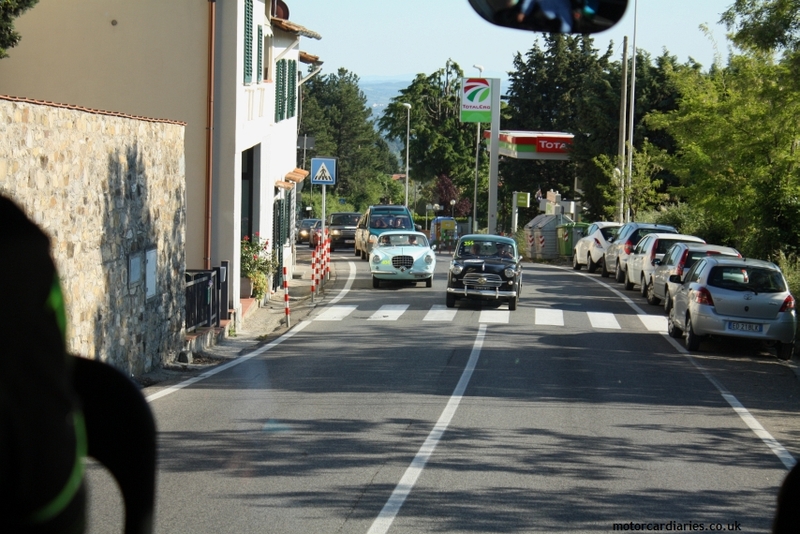 As if this divine serendipity isn’t joyful enough, the section of the expansive field into which we have bumped includes many of the cars we had missed earlier in the week at Valeggio sul Mincio. Be still my beating heart! At first, a Mercedes-Benz 300SL ‘Gullwing’ is a treat but after a dozen or more have past, I’m yearning for something else. 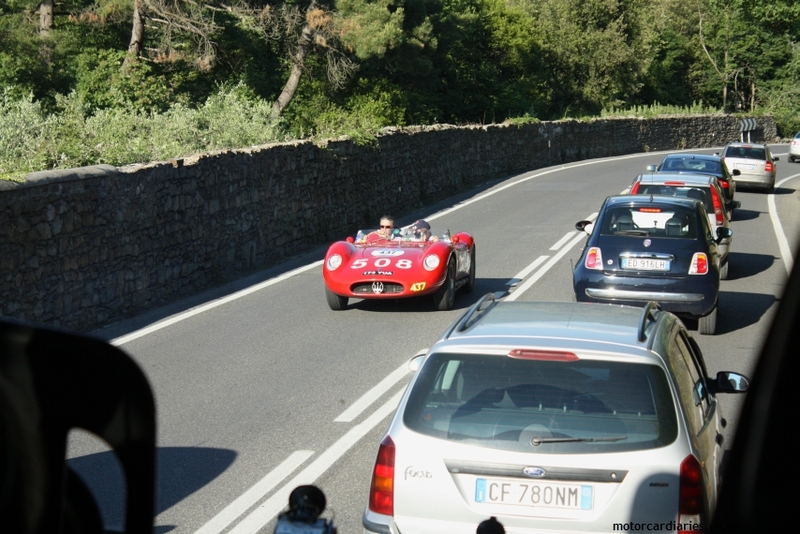 The amazing incongruity of open-topped Maserati, Ferrari and Porsche sports racers among the regular traffic never loses its buzz. 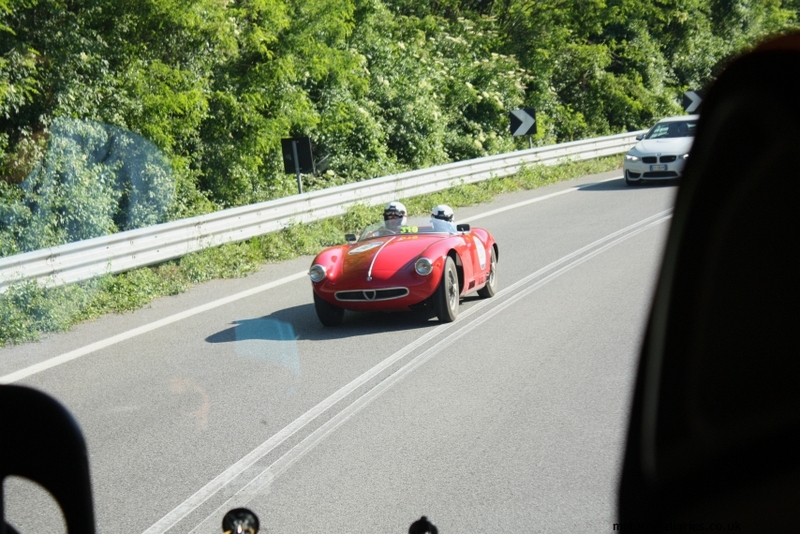 A 250S out on the open roads looks heaven-sent. It’s a magical moment and such a welcome surprise. 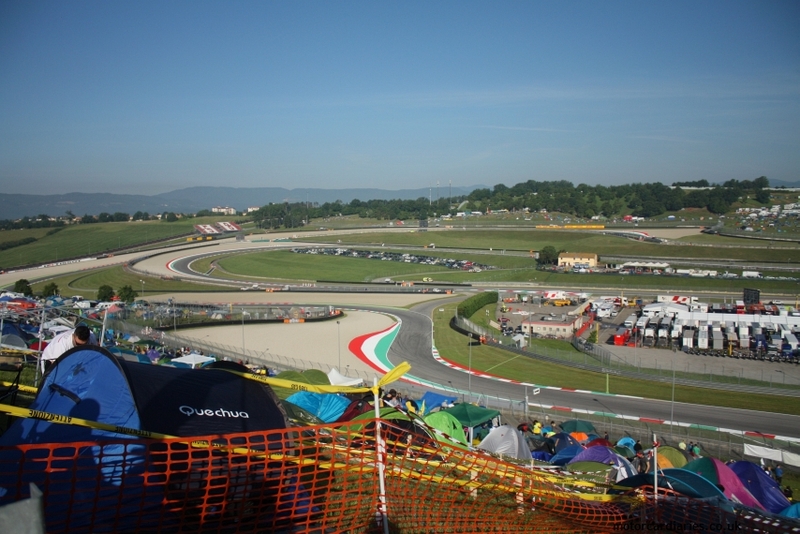 Race day delivers another glorious morning in the Tuscan hills. 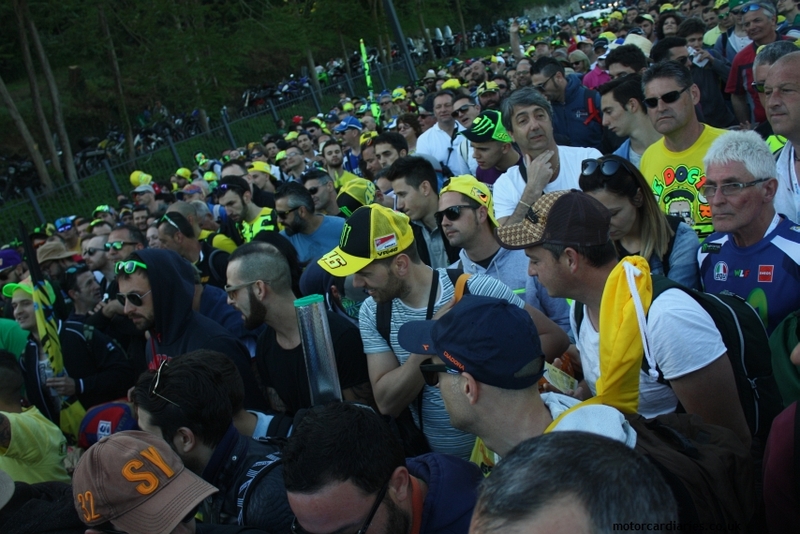 There are dense queues to get in but Rossi’s pole has added a frisson of extra excitement to proceedings – as if it were needed. 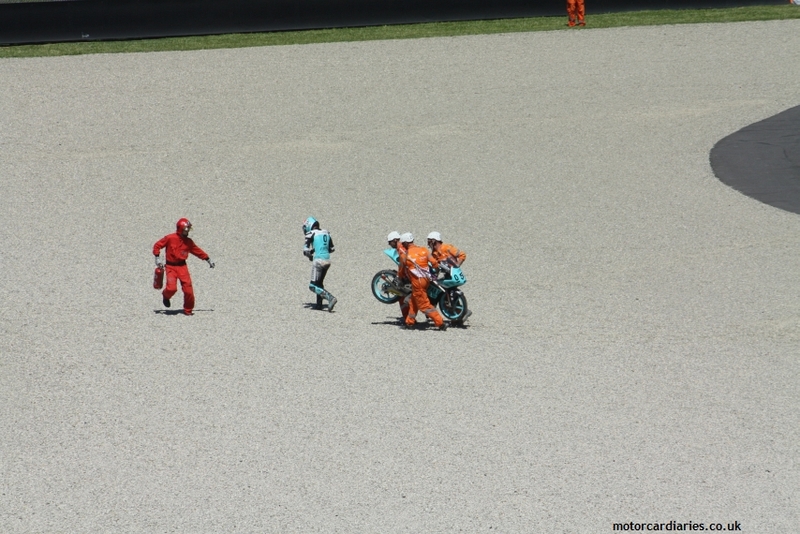 Moto3 kicks off proceedings and it’s a demonic battle from beginning to end. 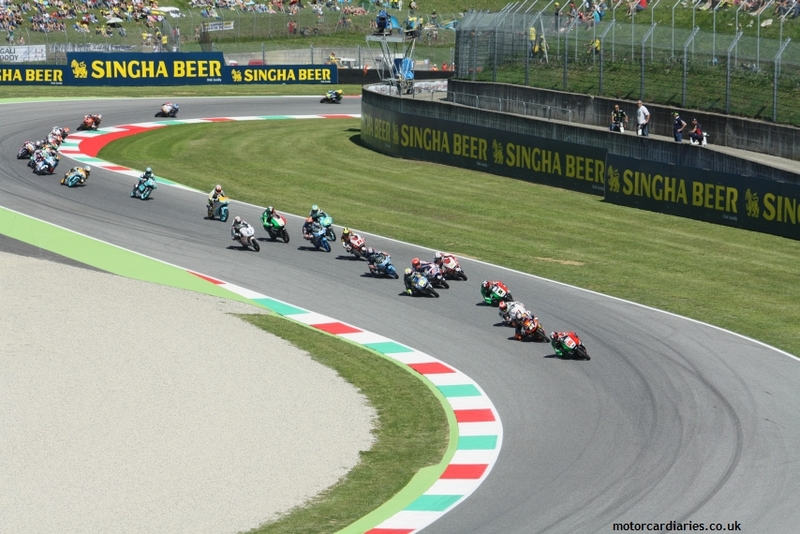 So close are the manufacturers and riders that virtually the entire field runs as one. At one stage I count 24 riders in the leading group though it doubtless exceeds that at times. It’s actually impossible to follow with any kind of accuracy as the buzzy juniors swarm every available inch of the track in a fast-circulating pack. The commentary is as lively and impassioned as you would hope for, given the context of the event. 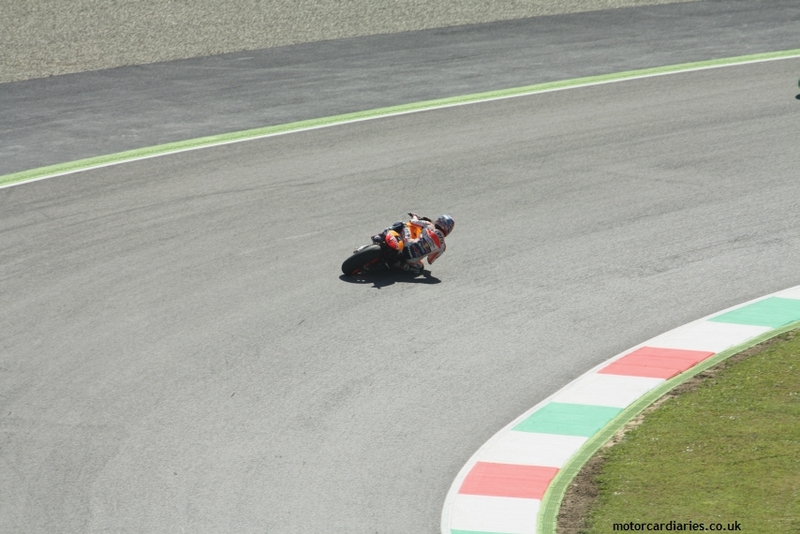 The one constant is South African Brad Binder (“BINDER! BINDER! BINDER!” as he is billed by the energetic commentator) who plays it perfectly to win by less than a tenth of a second. 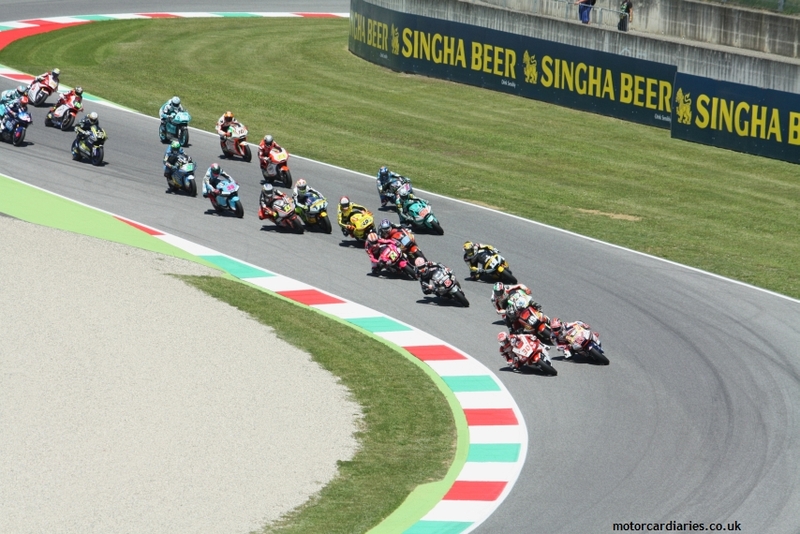 In fact, the top 20 is covered by less than five seconds after almost 40 minutes of racing. It’s a properly breathless start to the day and a real credit to the pups aboard the junior ‘bikes – their judgement and spatial awareness in the heat of battle is remarkable. I’m left to rue the lack of similar discipline from their equivalents on four wheels. 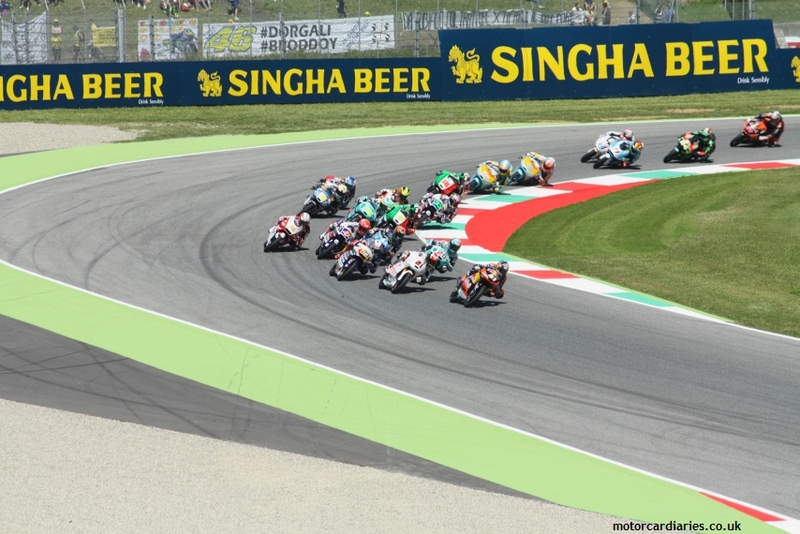 Moto2 is similarly entertaining, with an Italian in with a genuine shout of a win. 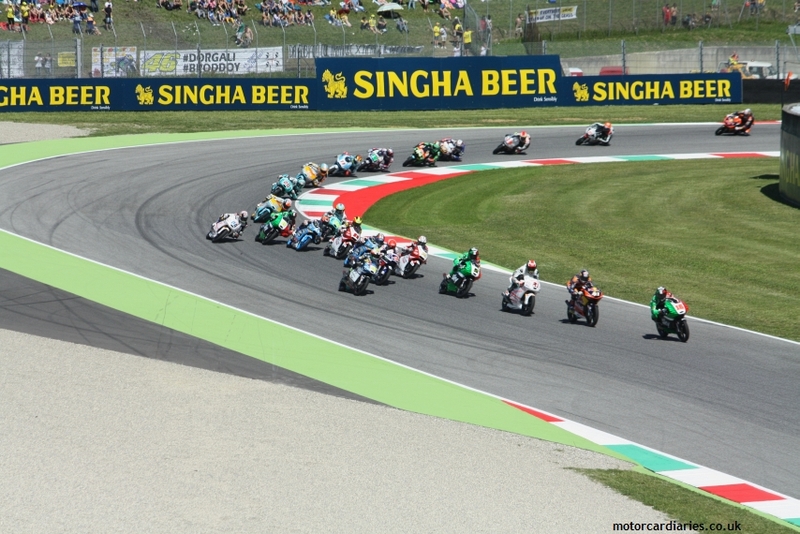 Lorenzo Baldassarri goes toe-to-toe with reigning champ Johann Zarco from across the border in France. Our wonderful commentators can’t control their excitement as Baldassarri looks set for the win before being pipped by Zarco right at the last. It’s nail-biting stuff but Zarco earned his win good and proper – the guy is a proper fighter and his performances in the top class in 2017 come as no surprise given his imperious form in Moto2. 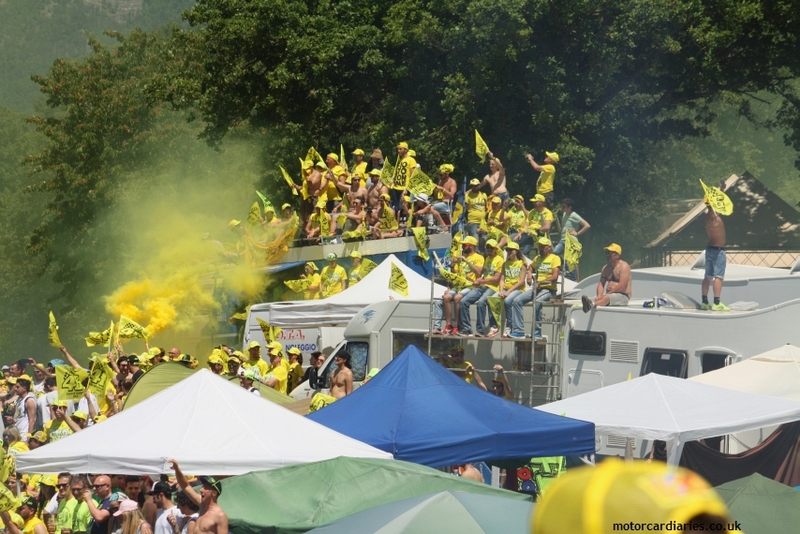 The crowd is rowdy, with more claxons and more yellow smoke sitting atop the spectator banks. 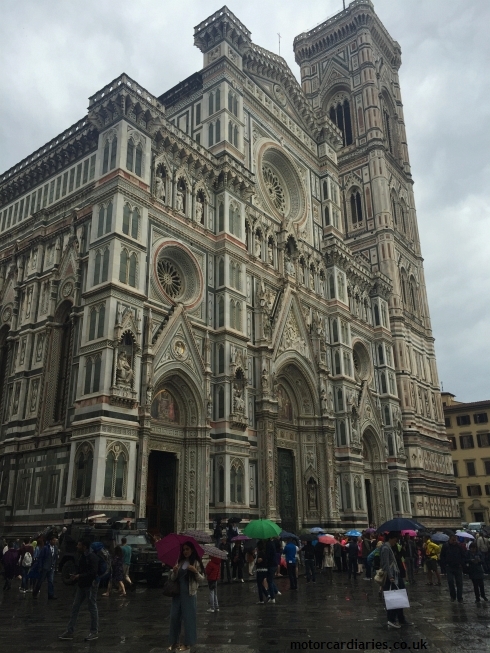 The atmosphere is electric – full of nervous excitement and tension. 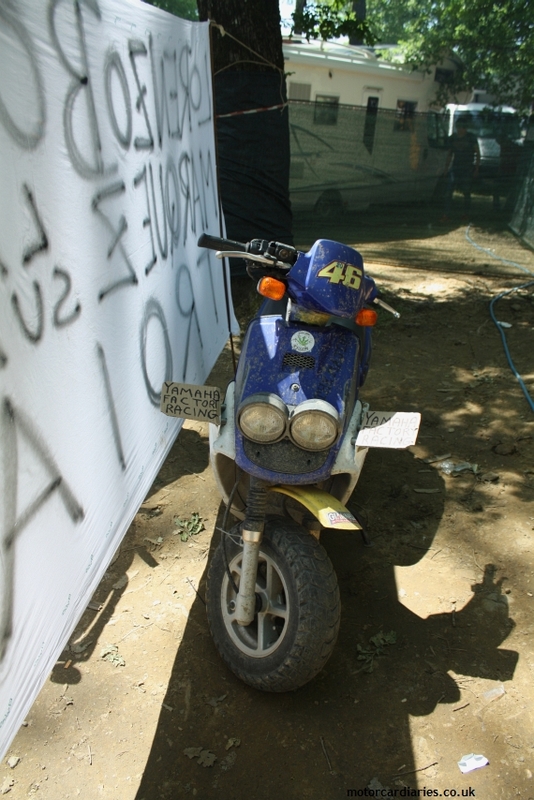 Surely, with local hearts broken by Baldassarri’s defeat in the support race, this is Valentino Rossi’s race? Not off the line. 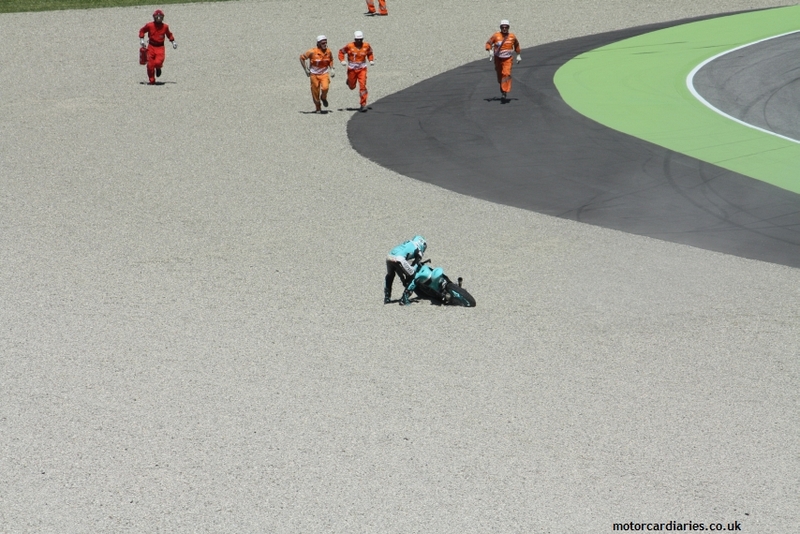 Team mate Lorenzo puts in the start of his life to bely his (relatively) poor qualifying performance. Lorenzo suffered a terminal engine failure in the morning warm-up and really hasn’t looked a factor all weekend but he’s bristling for the fight on Rossi’s home turf. 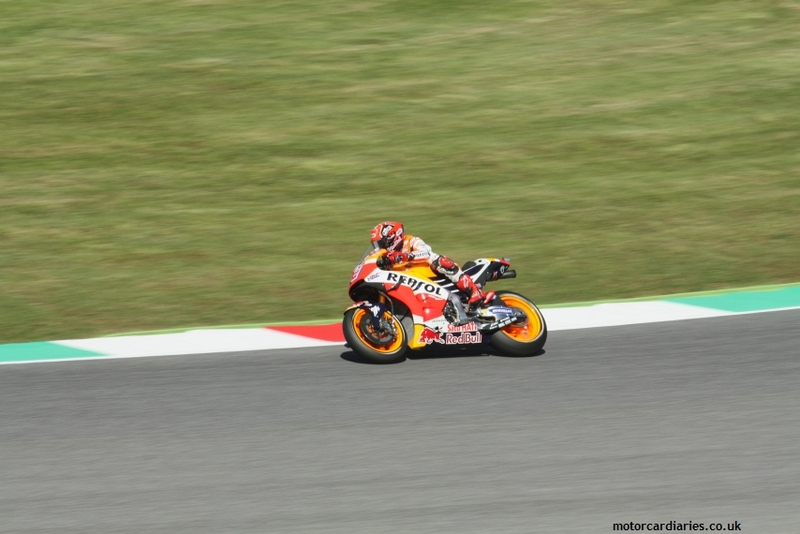 The two Yamaha protagonists commence battle, with Marquez hassling Aleix Espargaro immediately behind. 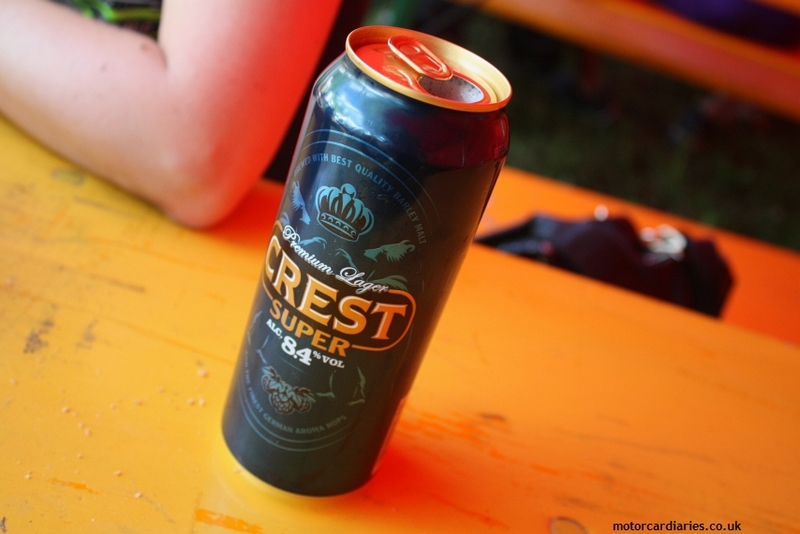 Then disaster! 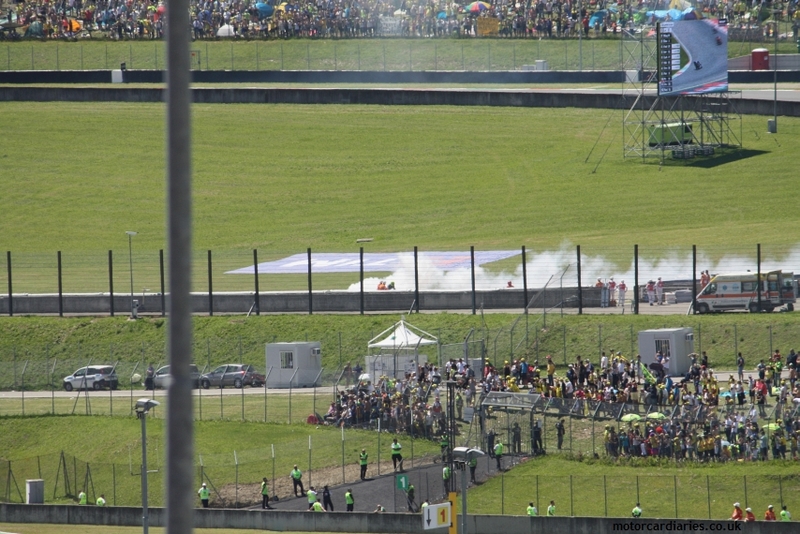 On the far side of the circuit, Rossi’s Yamaha motor has exploded in a cloud of white smoke. He will take no further part in proceedings. Local hopes dashed. The atmosphere darkens. In spite of the baking heat and brilliant sun, the vibes are fractious and many punters leave in disgust. 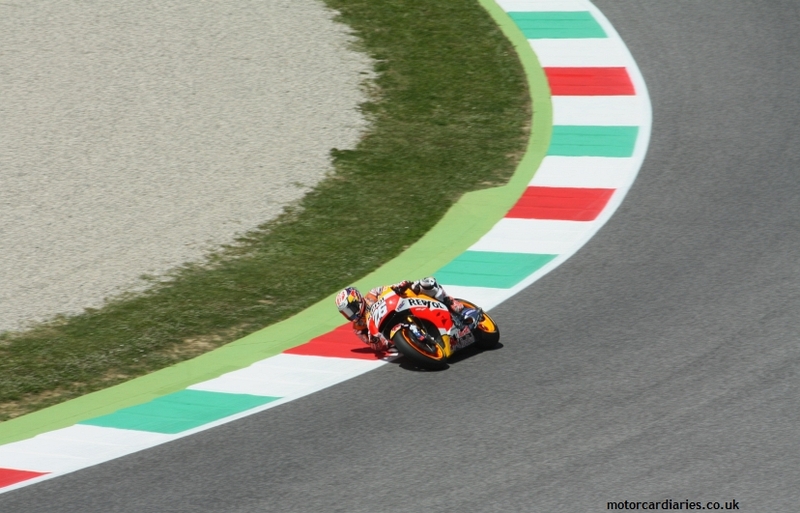 Such is their disdain for Marquez and Lorenzo; they’ve no interest in watching these titans go to war. It’s a really even fight with neither rider holding a decisive advantage. 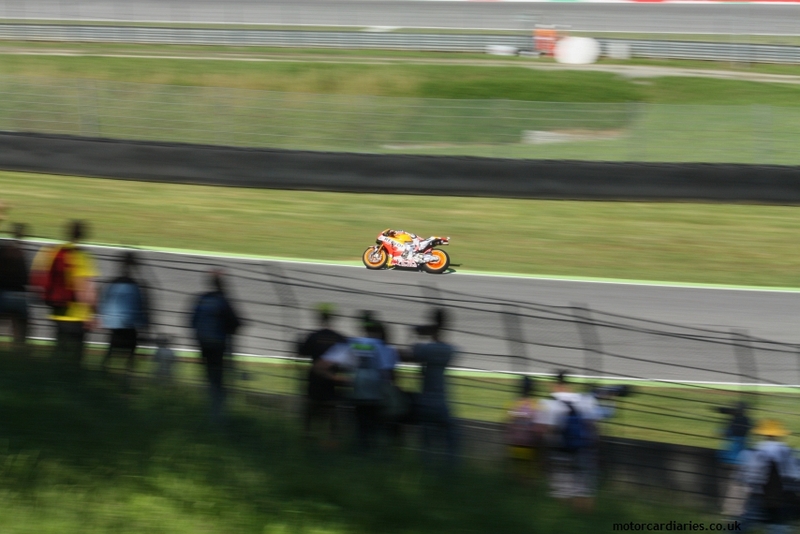 Lorenzo is at his towering best – it’s easy to forget just how good he can be. He snatches the win with a masterful tow out of the final corner of the last lap. 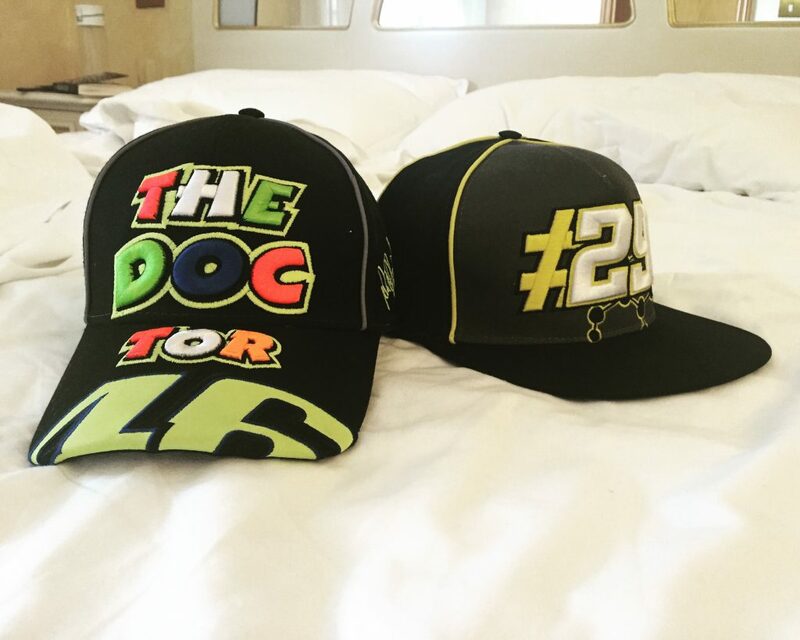 No DRS ‘pass flaps’ here, thank you – he simply gets the power down to better effect than his rival and drafts past him at 210mph. 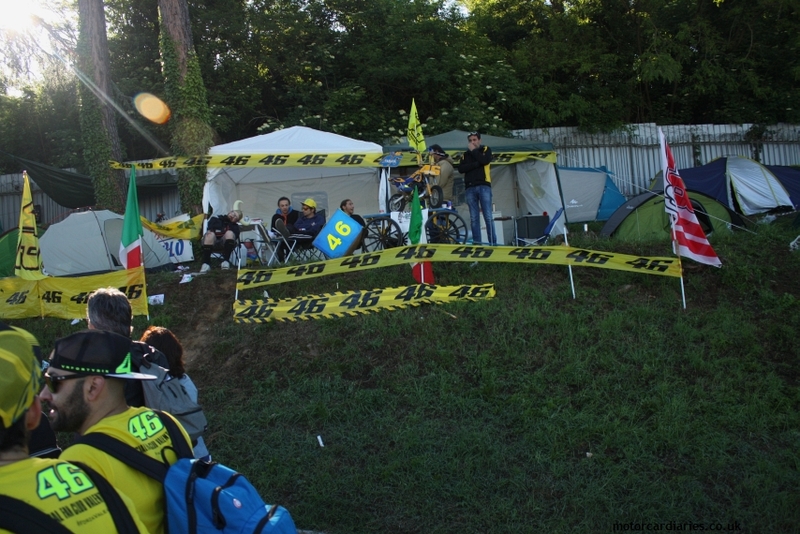 Proper stuff from proper riders – Valentino Rossi might be the favoured son but Mugello produced one of the great races of recent times and perhaps the retirement of the king added a theatrical element to proceedings which might otherwise have been lacking. And so we’re left to reflect on a truly dramatic weekend – a roller coaster of emotions played out at a roller coaster of a circuit. 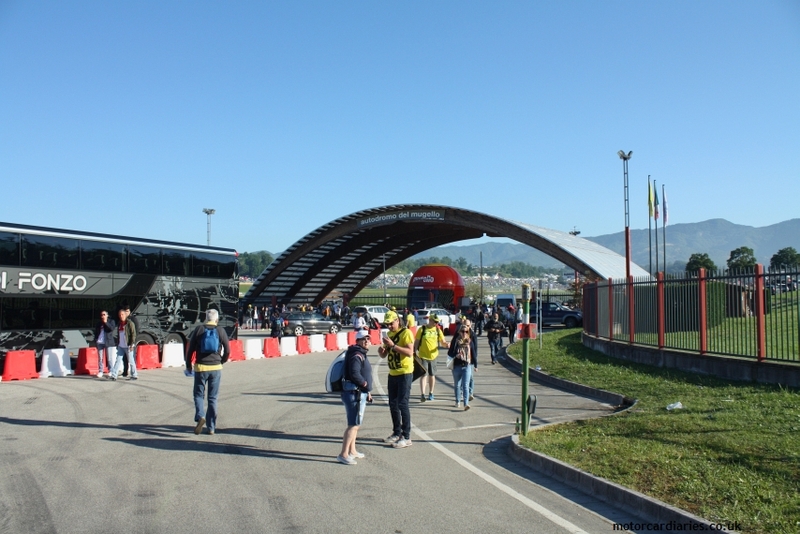 Mugello is just the most stunning facility and certainly among the most picturesque I’ve ever visited. 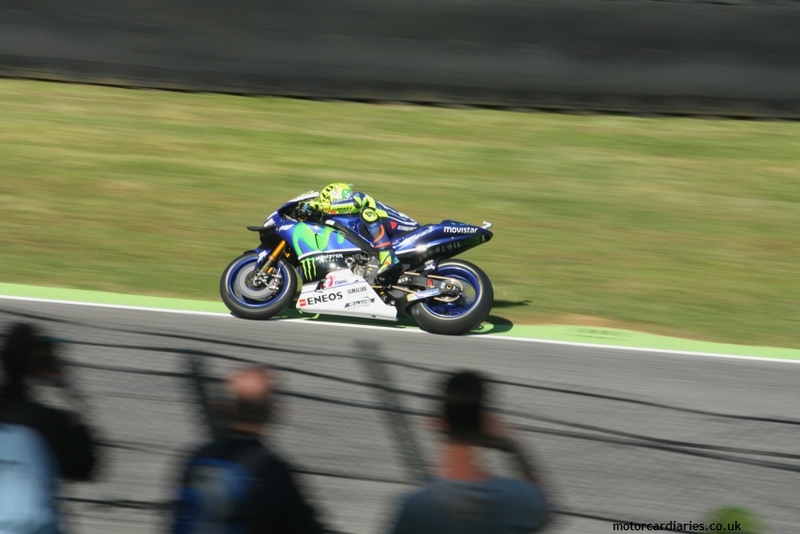 The Rossi factor creates an atmosphere like no other. 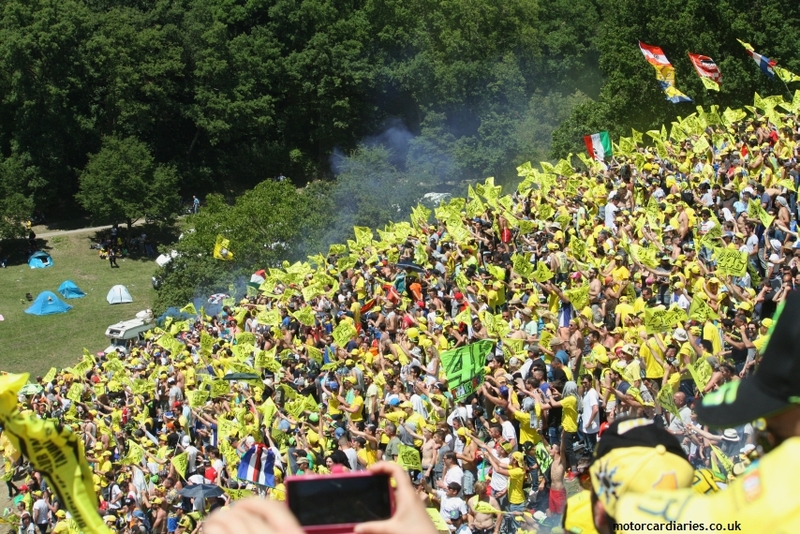 It simply must be experienced once in a lifetime, though the petulance on display after Rossi’s retirement leaves a slightly bitter taste. He may transcend the sport but he shouldn’t define it. 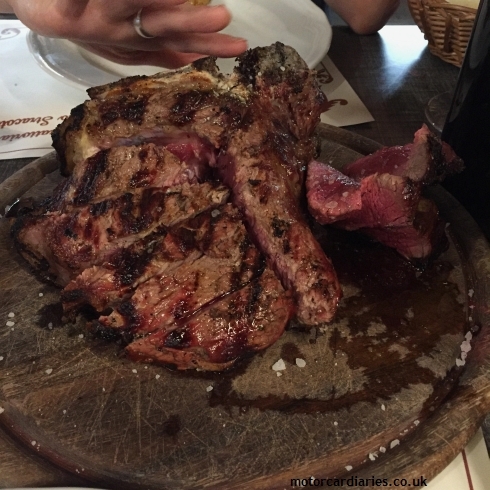 We find a little time to explore Florence and savour its culinary speciality: bistecca alla Fiorentina. 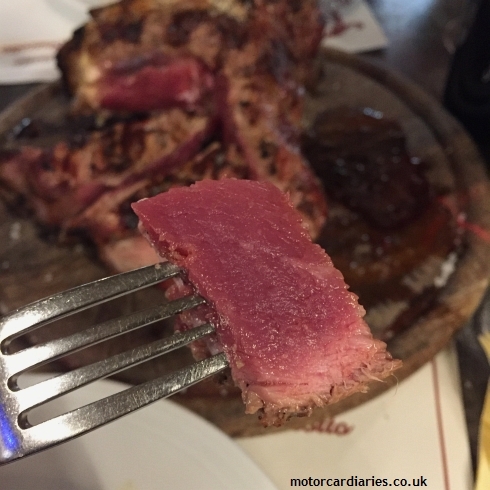 This is a huge slab of seasoned beef, served on the bone and cooked perhaps only momentarily. It’s divine. 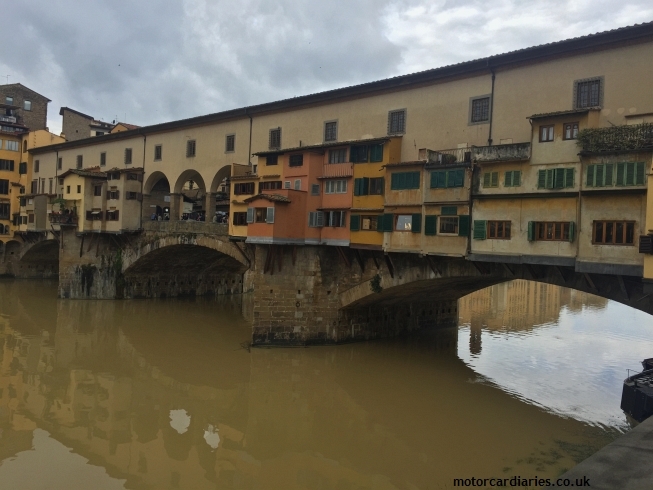 There are a thousand guide books which might better describe the wonder of Florence but it’s a beautiful city packed full of beautiful people and its proximity to Mugello offers the perfect excuse to explore. 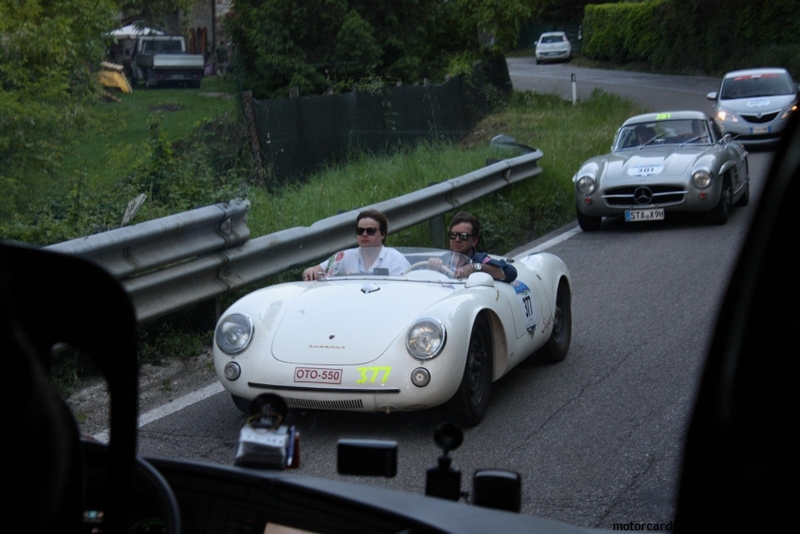 Its restrained elegance serves to offer a balanced counterpoint to the lunacy of Mugello on a race weekend.